Thought I'd wrap up my Sub Pop Records homage this weekend with a tribute to what helped brand the label, at least in the earlier stages of it's existence - singles. I never belonged to the fabled Sup Pop Singles of the month club, which from what I understand is about to be reintroduced. Nevertheless, various "editions" made their way into my collection. It wasn't the collectibility or prestige of these one-off Sub Pop 7" that appealed to me, rather the music. Champagne, IL's Poster Children is a perfect example. 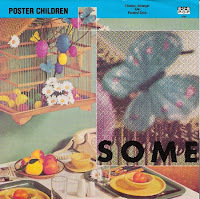 Sporting an art-deco-ish sleeve and two exclusive songs, Pop Records single of the month for October 1990 featured the dexterous and rattling "Thinner, Stronger," backed with the taught, mildly dissonant "Pointed Stick." Perhaps not indie-rock manna for the ages, it was still an enormous treat for Poster Children fans, not to mention an ideal appetizer for their 1993 major label debut, Tool of the Man. Wonderful people as well. Here's hoping that Rick and Rose revive their Radio Zero program. 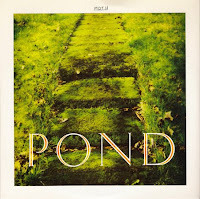 The aforementioned Pond 7" was independent of the Sub Pop Singles series, but by golly, the Tsunami/Velocity Girl split 45 brandished the hallowed tag for the January 1992 installment, and honorably so. Featuring two Wash D.C. area pop conglomerations that would become mightily accomplished in the months and years to come, this beautiful see-thru, ruby-ish slab of wax was a signal of sorts, sent to the hipster cognoscenti of the moment that Sub Pop wasn't just about grunge anymore. The signal resonated from the very moment the record stylus planted itself in the groove of Velocity Girl's "Warm/Crawl," the first half sublime shoegazer bliss, the latter, quintessential noise-pop. Tsunami's "Left Behind," was a valiant effort, but their best work was clearly ahead of them. Aside from this single, Velocity's "Warm/Crawl" was only available on CD in the form of a four-cut Velocity Girl sampler, ostensibly only sent to radio stations. If anybody knows how I can get my hands on an original, don't be a stranger. Update: The Poster Children are now sharing both sides of this single alongside many other rarities on a Bandcamp'ed compilation, Copyright. Since this is the case I am really no longer at liberty to share it. Please show 'em some love!. oh man. this velocity girl song. fantastic. oh man..thanks so much. More sub pop stuff like this/Green River concert etc. please!!!! I saw The Poster Children perform in a Cincinnati laundry (No BS!) in front of 45 people and they played like they were headlining at Madison Square Garden. To be serious and have any sense of humor is a trick few can pull off and this band was at the front of the line. John, that would have been Sudsy Malone's Rock 'n Roll Laundry & Bar! I drove down from Ann Arbor, MI to see them there. The show was fantastic and the bass so loud that it made my travel companion ill.
Back in the old days of the 90's, my college radio station had that Velocity Girl sampler CD with Warm/Crawl on it. I remember playing it on the air and loving the hell out of that song. Should've stolen the cd. No, no, that would've been wrong. can you, please, repost these singles? 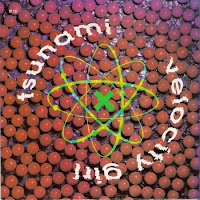 I still have that Velocity Girl/Tsunami single as well as a few others. I was stationed in D.C. when they were all active but I never took advantage and saw either of them. Yes I'm an idiot. Singles Going Single #55: Vertigo - Rub 7"